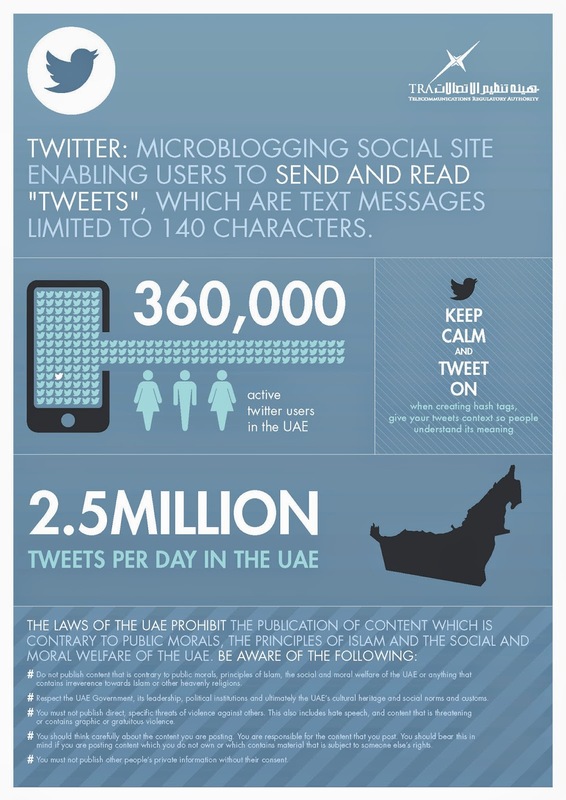 On Sunday (July 13), the Telecommunications Regulatory Authority (TRA) launched a white paper regarding Twitter usage as part of "The UAE Social Media White Papers" collection. The Twitter White Paper says: The laws of the UAE prohibit the publication of content which is contrary to public morals, the principles of Islam and the social and moral welfare of the UAE or any content that contains irreverence towards Islam and any other heavenly religions. 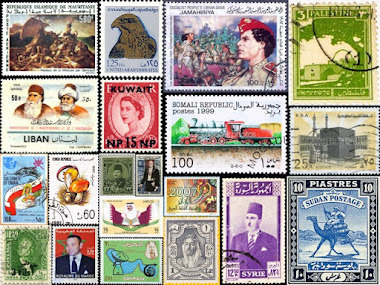 The content must also respect the UAE Government, its leadership, political institutions and ultimately the UAE’s cultural heritage and social norms and customs. Initially, users must not publish direct, specific threats of violence against mothers. This also includes hate speeches, and content that is threatening or contains graphic or gratuitous violence or any content that is offensive for a nation or its government. 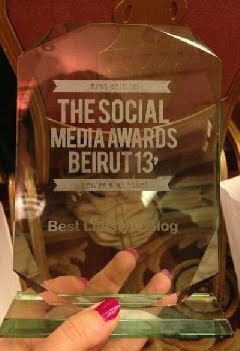 Users should think carefully about the content they are posting. Users are responsible for the content they post and should bear this in mind if they are posting content which they do not own or which contains material that is subject to someone else’s rights. Also, users must not publish other people’s private information without their consent. The social networks included in “The UAE Social Media White Papers”’ collection are Facebook, Twitter, Instagram, YouTube, Yahoo/Flickr, LinkedIn, Gmail, Microsoft Outlook, Apple Store, Blackberry and Keek. Full versions of the white papers and the corresponding infographics are accessible via the TRA’s official website: http://www.tra.gov.ae/WhitePaper/twitter.php. It is a day for all children, everywhere, to raise their voices and be heard. 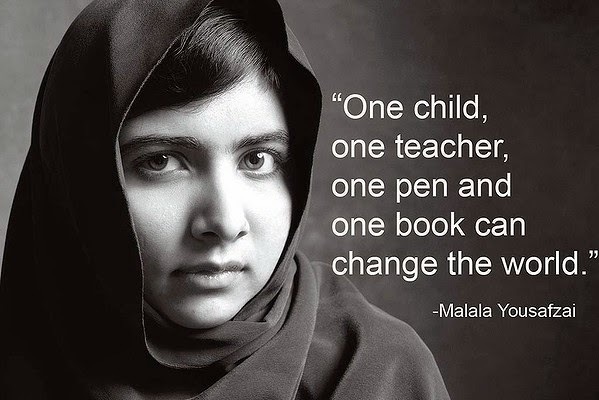 MalalaYousafzai is an advocate for universal education and girls' rights. The young Pakistani girl was targeted for her activism. In October 2012, the Taliban boarded her school bus and shot her and two other girls. But after recovering, Malala was back at school and continues to campaign for every child’s right to education. Globally, one in five girls around the world is denied an education by the daily realities of poverty, discrimination and violence. Every day, young girls are missing from education, isolated from their friends, forced into marriage and subjected to violence. Not only is this unjust, it is a waste of potential with serious global consequences. Supporting girls' education is one of the single best investments to help end poverty. I believe in the power of education as a force for good in the world and the right for all children to get a good quality education, no matter where they are and what the circumstances. I believe that the most precious gift you can give a child is the capability to read and write. There is magic in holding a book and reading a story. I have seen firsthand how losing the ability to read and write is like giving up on life. Millions of girls are being denied an education when it has the power to transform their lives and the world around them. Making it through both primary and secondary education is critical to girls being able to help break the cycle of poverty. more likely to understand her rights and be a force for change. 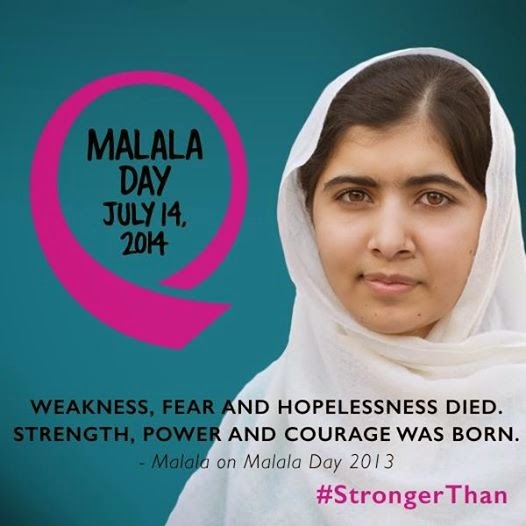 Last year, on July 12, 2013 Malala turned 16. To celebrate Malala Day, the global community came together to highlight the leading role youth can play in enabling all children to get an education. Malala marked the day by giving her first public speech since the shooting dedicated to the importance of universal education at the United Nations Headquarters in New York. "The terrorists thought they would change my aims and stop my ambitions, but nothing changed in my life except this: weakness, fear and hopelessness died. Strength, power and courage was born... I am not against anyone, neither am I here to speak in terms of personal revenge against the Taliban or any other terrorist group. I'm here to speak up for the right of education for every child. I want education for the sons and daughters of the Taliban and all terrorists and extremists," Malala said in her speech. In support of the UN Secretary-General’s Global Education First Initiative, international youth leaders convened at the UN and in cities around the world in support of reaching the goal of having all children, especially girls, in school and learning by 2015. 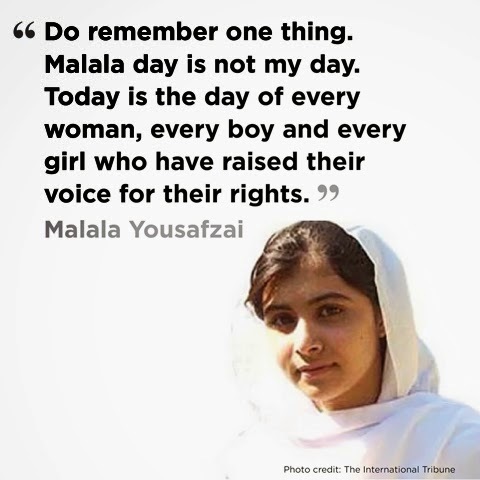 "Malala Day is not my day. Today is the day of every woman, every boy and every girl who have raised their voice for their rights." Today, 61 million children and young people are denied the right to education. If world leaders, governments, civil society and the global community do not take decisive action now, the result is clear: the largest generation of youth in human history will be exposed to unemployment, poor health, civil unrest and increased vulnerability. We firmly believe that education is the most effective solution to poverty. We cannot afford to not educate the future generations of our planet -- education is a smart investment. Guarantee gender equality by recognizing and respecting the rights and potential of all girls as equals of boys, and by taking real steps to enable and support all girls to become active, educated and productive citizens of their country and of the world. Place particular emphasis on education for marginalize children [including girls; poorer children; child laborers and slaves; those living in disadvantaged areas, in informal settlements or on the street; pregnant girls and girls with their own children; children with disabilities; indigenous children, lesbian, gay, bisexual and transgendered young people and children and young people affected by emergencies and conflict] whose absence from the classroom has not yet been effectively addressed. Steps they take must tackle obstructions to their education and cater for their specific needs to guarantee their learning is worthwhile, fulfilling and contributes to their development. Support the availability and improvement of non-formal and vocational education and training. Governments must recognize the importance of practical training and how this can complement academic education and sustain existing industries. Governments must ensure that any vocational education that students receive matches the high standards expected of academic education, and that it is conducted safely and is properly documented. Connect education more directly with the labor market to ensure that all children and young people can seek opportunities after completing their education through, for example, internships, volunteering and mentorships, as well as being able to gain the formal accreditation and qualifications they may require for their future. Effective career guidance and planning should allow children and young people to consider their ambitions and options, and give them direction on how they can pursue and achieve their goals for the future. Develop and promote citizenship education as a way of educating children and young people on the important realities of life, to reduce extremism, to promote equality and respect, to ensure children are aware of their rights and responsibilities, to help them to realize their position as a citizen of the world and to enhance their emotional and physical well-being. Recruit and rigorously train teachers who implement the highest standards of teaching, are in attendance and available to all of their students, and who protect the rights of every student. Donor countries should increase aid allocation to education. All governments should individually and justly target funding and resources to close spending gaps, which put children at a disadvantage because of the location of their school, conflict and other factors, and must prevent the leakage, wastage or misdirection of financial resources resulting from inefficiency or corruption. Meaningfully engage young people in shaping our own education by facilitating processes and installing structures which allow youth to contribute their opinions, to influence the direction of their own education and to have a say in the nature of the school and the curriculum. Students must have an avenue through which they can indicate concerns, report inappropriate or unprofessional behavior or seek a resolution to a grievance without prejudice and in confidence. We firmly believe that education is the most effective solution to poverty. We want a world where children and young people are both in school and are engaging -- where we are both being taught, and are learning. We are convinced that these steps will enhance access to and the quality of education systems, will ensure that no child is left behind and will make the world a fairer, more just, educated, productive and better place. We have to deliver this promise. Governments of the world have to deliver this promise. With so many children out of school due to violence and wars all over the world -- most notably now in Syria and Palestine -- reaching the goal of having all children, especially girls, in school and learning by 2015 is quite a challenge. But it is one well worth trying to achieve.